The scalp delineates the superior margin of the body, a position that is commonly exposed to considerable insults from the surrounding environment. Its exposed location, which is generally devoid of clothing coverage, makes the scalp susceptible to burns and other trauma that can produce extensive scarring and disfigurement. Additionally, the scalp is subject to a staggering variety of benign and malignant neoplasms, often as the result of years of sun exposure. Today, many scalp defects encountered prior to reconstruction are the product of ablative surgery, often Mohs micrographic surgery. Tissues that are traumatized, irradiated, or infected surround many of these defects. Patients are frequently elderly with multiple medical problems that may limit their ability to tolerate certain procedures. Thus, the repair of a scalp defect can involve treatments ranging from the simplicity of a few sutures to a multi-month, multi-procedure reconstruction. The decision-making process behind a successful outcome requires a solid knowledge of anatomy, a clear evaluation of the defect, the recognition of relevant patient attributes, and the knowledge of a variety of reconstruction options. Preoperative planning is imperative. Preoperative plans must be specifically tailored to the individual problem because no single solution is available for reconstructing the scalp. An image depicting scalp anatomy can be seen below. Scalp anatomy, demonstrating the several layers. The surgeon should clearly understand the elements of scalp anatomy before attempting reconstructive procedures. The scalp is defined as the anatomic area overlying the skull between the superior orbital rims anteriorly and the superior nuchal line posteriorly. This anatomic space is divided into hair-bearing and non–hair-bearing (ie, forehead) segments. The forehead further is divided into 5 subunits: the central, the left and right temporal, and the left and right brow subunits. The soft tissue within this region is commonly divided into 5 layers: skin, subcutaneous tissue, aponeurosis (galea), loose areolar tissue, and pericranium. These layers easily are remembered using the mnemonic "SCALP" (see the image below). An external layer of thick skin is fixed to the underlying subcutaneous layer of fat. This subcutaneous layer is richly vascularized and provides a fibrous bridge to keep the skin tightly fixed to the galea aponeurosis (ie, epicranium) beneath. The galea aponeurosis is essentially the membranous tendon extension connecting the frontalis and occipitalis muscles, and it is the superficial musculoaponeurotic system (SMAS) layer of the scalp. The galea aponeurosis becomes an important layer clinically, especially with coronal defects through the galea, because the antagonistic forces of the frontalis and occipitalis muscles widely separate the wound edges. However, if the aponeurosis remains intact, skin retraction is much more limited. When reconstructing scalp defects, limiting separation of the galea from the overlying skin is important to avoid devascularizing the skin. Laterally, the galea becomes contiguous with the temporoparietal fascia (ie, superficial temporal fascia). The temporoparietal fascia is a richly vascularized layer that envelopes several key structures, notably the frontal branches of the facial nerve, the auriculotemporal nerve, and the superficial temporal artery and vein. Below the galea is a layer of loose connective or areolar tissue. This layer provides for relatively free movement between the aponeurosis and the deepest layer, the pericranium. It also creates a point of separation during traumatic scalping injuries. The pericranium is composed of dense connective tissue tightly affixed to calvarial bone by Sharpey fibers. In general, these fibers are easy to strip off the underlying bone, although they may be strongly adherent along the cranial sutures. As the pericranium approaches the superficial temporal line laterally, it divides to form 2 layers, the temporalis muscle fascia (deep temporal fascia) and the pericranium of the temporal bone. These 2 layers together invest the body of the temporalis muscle. Inferior to the temporalis muscle, the temporalis fascia splits to invest the superficial temporal fat pad, and then it inserts into the zygomatic arch. 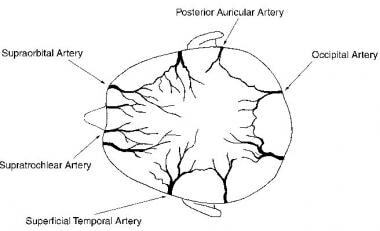 Although a rich network of anastomotic connections is present, the blood supply to the scalp is primarily derived from 5 pairs of arteries (see the image below). Arising from the ophthalmic artery and thus from the internal carotid artery, the supratrochlear and supraorbital arteries supply the forehead and anterior scalp. The external carotid gives rise to 3 pairs of arteries, the superficial temporal, postauricular, and occipital. These vessels are found in the subcutaneous layer immediately superficial to the galea with only minimal contributions to the deep pericranial layer. The pericranium is nourished via the middle meningeal and intracranial circulation to the calvarial bone. As a result, disruption of blood supply to the scalp does not result in calvarial bone necrosis. Venous drainage parallels the arterial system and eventually drains into the internal and external jugular veins. The 5 pairs of arteries that supply the scalp. Interestingly, sensory innervation of the anterior scalp is derived from all 3 branches of the trigeminal nerve via the supraorbital and supratrochlear nerves (V1), the zygomaticotemporal nerve (V2), and the auriculotemporal nerve (V3). The posterior scalp receives sensory innervation from cervical sensory branches through the greater (C2) and lesser (C2, C3) occipital nerves. Motor innervation to the forehead derives from the facial nerve. The frontal branch of the facial nerve exits the parotid gland running in an oblique line lateral to the lateral orbital rim to supply the frontalis, corrugator supercilii, and procerus muscles. A posterior auricular branch of the facial nerve provides function to the occipitalis muscle. Motor branches, which are the deep temporal branches of the mandibular nerve (V3), innervate the temporalis muscle. Lymphatic drainage of the scalp runs primarily into the ring of lymph nodes located along the junction of the head with the neck. These are the submental, submandibular, parotid/preauricular, retroauricular/mastoid, and suboccipital nodes. These groups of lymph nodes eventually drain into the deep cervical chains of lymph nodes. No specific contraindications exist for scalp reconstruction. However, if the patient's underlying medical condition(s) prevent general anesthesia, this may limit the scope of the planned reconstruction. In rare patients, significant medical risk factors may prevent even the most limited reconstructions, including procedures that can be performed with the patient under local anesthesia. In these patients, strong consideration should be given to allowing the wound to heal by secondary intent. The surgeon's role in these situations is not so much to reconstruct the scalp but to coach it through the healing process with good wound care and conservative debridement of nonvital tissues when necessary. Desai SC, Sand JP, Sharon JD, Branham G, Nussenbaum B. Scalp reconstruction: an algorithmic approach and systematic review. JAMA Facial Plast Surg. 2015 Jan-Feb. 17 (1):56-66. [Medline]. Oishi SN, Luce EA. The difficult scalp and skull wound. Clin Plast Surg. 1995 Jan. 22(1):51-9. [Medline]. Hsia JC, Moe KS. Vacuum-assisted closure therapy for reconstruction of soft-tissue forehead defects. Arch Facial Plast Surg. 2011 Jul-Aug. 13(4):278-82. [Medline]. Sabapathy SR, Venkatramani H, Bharathi RR, D'Silva J. Technical considerations in replantation of total scalp avulsions. J Plast Reconst Aesth Surg. 2005. 59:2-10. Ellis M, Hwang L, Ford NK, Slavin K. The Role of the Visor Flap in Scalp Reconstruction: A Case Series of 21 Patients. Oper Neurosurg (Hagerstown). 2018 Mar 14. [Medline]. Shen H, Dai X, Chen J, Wang J, Zhang Z, Cai Z. Modified Unilateral Pedicled V-Y Advancement Flap for Scalp Defect Repair. J Craniofac Surg. 2018 Feb 14. [Medline]. Jeong SH, Koo SH, Han SK, Kim WK. An algorithmic approach for reconstruction of burn alopecia. Ann Plast Surg. 2010 Sep. 65(3):330-7. [Medline]. Agochukwu NB, Wong L, Liau JY. Dermal Regenerative Template as a Cost-Effective Alternative for Complex Scalp Reconstruction. J Craniofac Surg. 2018 Jan. 29 (1):e73-7. [Medline]. Spector JA, Glat PM. Hair-bearing scalp reconstruction using a dermal regeneration template and micrograft hair transplantation. Ann Plast Surg. 2007 Jul. 59(1):63-6. [Medline]. Gosain AK, Zochowski CG, Cortes W. Refinements of tissue expansion for pediatric forehead reconstruction: a 13-year experience. Plast Reconstr Surg. 2009 Nov. 124(5):1559-70. [Medline]. Gencel E, Eser C, Tabakan I, Kesiktas E, Yavuz M. Outcomes of Tissue Expander Application for Scalp Reconstruction in Extensive Aplasia Cutis Congenita. Aesthetic Plast Surg. 2016 Feb. 40 (1):114-9. [Medline]. Baker SR, Johnson TM, Nelson BR. Technical aspects of prolonged scalp expansion. Arch Otolaryngol Head Neck Surg. 1994 Apr. 120(4):431-6. [Medline]. Azzolini A, Riberti C, Cavalca D. Skin expansion in head and neck reconstructive surgery. Plast Reconstr Surg. 1992 Nov. 90(5):799-807. [Medline]. Calobrace MB, Downey SE. Calvarial deformity and remodeling following prolonged scalp expansion in a child. Ann Plast Surg. 1997 Aug. 39(2):186-9. [Medline]. Feierabend TC, Bindra RN. Injuries causing major loss of scalp. Plast Reconstr Surg. 1985 Aug. 76(2):189-94. [Medline]. Snow SN, Stiff MA, Bullen R, Mohs FE, Chao WH. Second-intention healing of exposed facial-scalp bone after Mohs surgery for skin cancer: review of ninety-one cases. J Am Acad Dermatol. 1994 Sep. 31(3 Pt 1):450-4. [Medline]. Hazani R, Buntic RF, Brooks D. Microsurgical scalp reconstruction after a mountain lion attack. Ann Plast Surg. 2008 Sep. 61(3):265-8. [Medline]. Ebihara H, Maruyama Y. Free abdominal flaps: variations in design and application to soft tissue defects of the head. J Reconstr Microsurg. 1989 Jul. 5(3):193-201. [Medline]. Borah GL, Hidalgo DA, Wey PD. Reconstruction of extensive scalp defects with rectus free flaps. Ann Plast Surg. 1995 Mar. 34(3):281-5; discussion 285-7. [Medline]. Sosin M, Schultz BD, De La Cruz C, et al. Microsurgical scalp reconstruction in the elderly: a systematic review and pooled analysis of the current data. Plast Reconstr Surg. 2015 Mar. 135 (3):856-66. [Medline]. Janus JR, Peck BW, Tombers NM, Price DL, Moore EJ. Complications after oncologic scalp reconstruction: a 139-patient series and treatment algorithm. Laryngoscope. 2015 Mar. 125 (3):582-8. [Medline]. Hallock GG. Long-term superiority of composite versus muscle-only free flaps for skull coverage. Ann Plast Surg. 2004 May. 52(5):507-10; discussion 510-1. [Medline]. Marathe US, Sniezek JC. Use of the vacuum-assisted closure device in enhancing closure of a massive skull defect. Laryngoscope. 2004 Jun. 114(6):961-4. [Medline]. Newman MI, Hanasono MM, Disa JJ, Cordeiro PG, Mehrara BJ. Scalp reconstruction: a 15-year experience. Ann Plast Surg. 2004 May. 52(5):501-6; discussion 506. [Medline]. Ozkan O, Coskunfirat OK, Ozgentas HE, Derin A. Rationale for reconstruction of large scalp defects using the anterolateral thigh flap: structural and aesthetic outcomes. J Reconstr Microsurg. 2005 Nov. 21(8):539-45. [Medline]. Serletti JM. Discussion: Management of a complex scalp defect. Plast Reconstr Surg. 2008 Aug. 122(2):626-9. [Medline]. Wang HT, Erdmann D, Olbrich KC, Friedman AH, Levin LS, Zenn MR. Free flap reconstruction of the scalp and calvaria of major neurosurgical resections in cancer patients: lessons learned closing large, difficult wounds of the dura and skull. Plast Reconstr Surg. 2007 Mar. 119(3):865-72. [Medline]. Split-thickness skin grafting. A: Merkel cell carcinoma of the scalp. B: A Mohs defect was the result of the carcinoma in this patient. Note that the central portion of the periosteum has become devitalized. 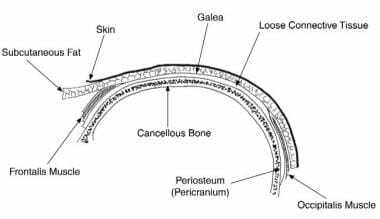 C: Where loss of periosteum has occurred, the outer table of the calvarial bone has been removed to reveal bleeding cancellous bone. A split-thickness skin graft has been applied. The central portion is healing by secondary intention. Tissue expansion. A: A large scalp wound has been skin grafted, and 2 tissue expanders have been inserted and inflated. B: The expanders have been removed, the skin graft has been excised, and the scalp flaps have been advanced. Rotation flaps. A: Large basal cell carcinoma of the forehead. B: The resulting Mohs defect. C: Closure with 2 superiorly based rotation flaps. D: Appearance at 6 months. An example of an A-to-T flap closure. Advancement flaps. A: Mohs defect over the scalp vertex from a squamous cell carcinoma. B: Closure with bipedicled advancement flaps based on the right superficial temporal and left postauricular artery. C: Defect resulting from paramedian forehead flap. D: Closure with bilateral horizontal advancement flaps. E: Result at 6 months. Transposition flaps. A: Large defect of the left anterior scalp. B: Design of transposition flap based on the superficial temporal artery. C: The flap is in place. The donor site will be skin grafted, and excess flap will be replaced in its original position in 3-4 weeks. D: Mohs defect of the anterior scalp. E: Inset of bilobed flap. F: Final result. Latissimus dorsi flaps. A: A latissimus dorsi free flap has been placed over the posterior aspect of the skull to reconstruct a defect resulting from removal of a large arteriovenous malformation. B: Tissue expanders have been inserted through zigzag incisions. C: Following expander removal, the skin of the free flap is excised, and hair-bearing scalp is advanced into the defect.